The capital of Andalusia is the third most visited city in Spain. Both foreigners and Spanish come to visit the city at any time of year. 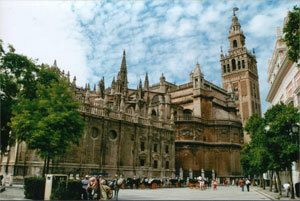 Discover the history of Seville is exciting, visiting historical monuments brings to mind each time that happened there. It also presents a lot of churches and religious buildings. The city is beautiful everywhere you look, the architecture of the buildings, houses, streets, bridges and buildings, all have a unique style that surprises tourists. Visit the museums are really interesting. And you can not miss the traditional visit to the square of bulls. Sevilla presents activities and tourist attractions everywhere for something big part of it was Monumental and Artistic Heritage. Seville Cathedral: This large Gothic building was declared a National Monument, but then also declared a World Heritage Site. The Chapel of San Antonio, the Chapel of the Virgin and the Altar are one of the most visited areas. In the Cathedral of Seville we see exposed beautiful works of art and sculptures. The Giralda: This is the most representative monument of the city. The Giralda is nearly 100 meters. high. Climb to the top of a ramp is very tiring but worth the effort when we are in the belfry resting with a spectacular view over the city. The Archive of the Indies: was founded in 1660, is a beautiful building with 2 floors and a central courtyard. It presents a lot of information and documents of the time, among the best known is the journal of Columbus. The Alcazar Palace or the Palace: One of the must in Seville. Knowing this set of palaces built with mixtures of different styles is a unique experience. The Alcázar began as a fortress but its architectural beauty made over time many monarchs was elected as his residence. Each palace has a different story and each offers a different attraction for tourists. The decoration of the courtyards and halls is really impressive. Like the gardens embellished with flowers and plants work. Do not miss it. Maestranza Bullring: The most traditional tour of the city, this yields are conducted most important bullfighting. The building is beautiful Maestranza, was built in the Baroque style and painted in white and gold. Also is decorated with arches and marble columns. You can visit and learn about the history of the place on a guided tour or attend a bullfight a Sunday afternoon. You can also visit the museum where you will see exposed bullfighters costumes and photographs. In Opera and Concert season you can go to any of the works and shows performed there.